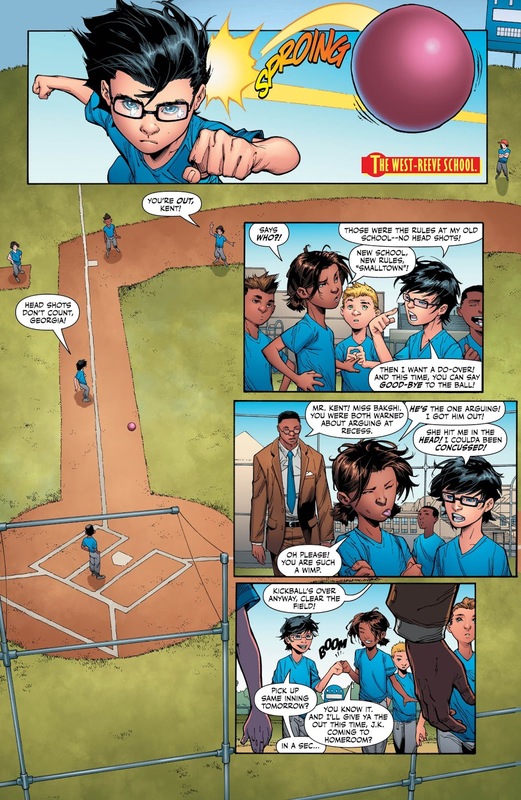 The issue opens with plenty of fun since it's Jon playing kickball! Did I ever tell you that I was kickball champ of Richland Elementary? No...well I was! Jon is fighting with his new friend, Georgia, over the head shot rules (we allowed it when I was kickball champ of Richland Elementary, btw) when Damian arrives for school...in his helicopter. Way to fit in Damian! That is one of the few things that has bothered me about this book and really comes to the forefront in this issue...Damian is a little jerk! I know what you're thinking, "Jim, Damian is always a jerk. That's his character." Stop thinking at me! 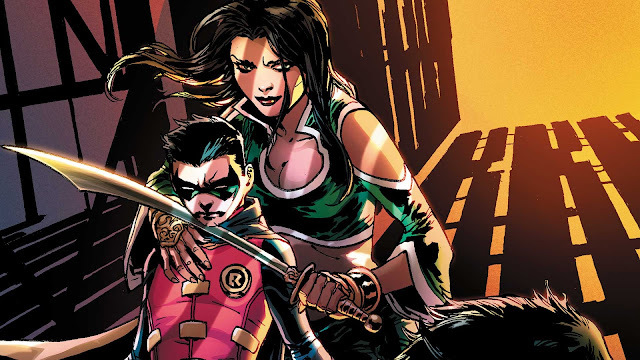 But seriously, I know that Damian is a jerk on the surface, but it's when we get a peak behind that tough exterior that made me a super fan of the character and it shocks me that Peter Tomasi doesn't give us more of that since his New 52 Batman and Robin book did it so well. Back to the book, after we see an inappropriatley dressed Talia spying on her son (seriously, with that outfit on, she may sens half the school into instant puberty overdrive! ), we get more of Damian being a jerk and Jon fitting in as a "normal kid". 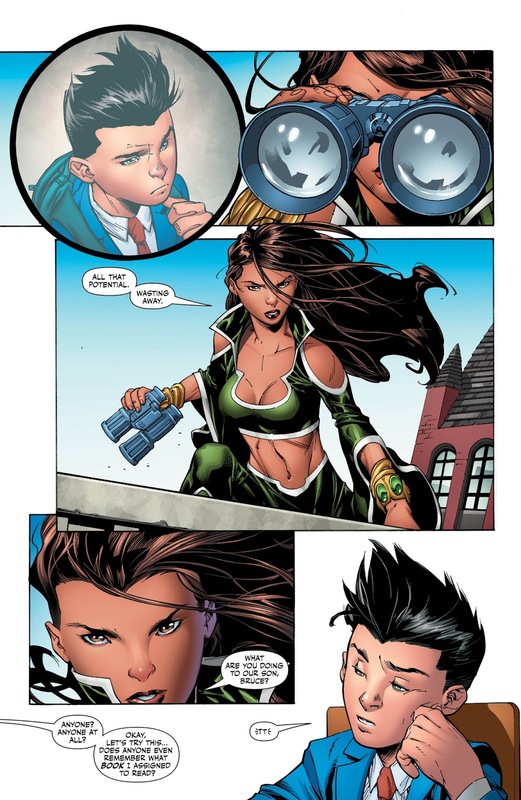 This all leads to the two boys coming face-to-face with Damian's mom and it seems like it's setup to give Jon a little more background on his crime fighting partner. I don't know why, but I actually thought Jon knew more than it seems he did already. The boys then hit the Gotham night and take down Ezar, an assasin that Damian trained, before getting more involved in League of Assasins stuff. 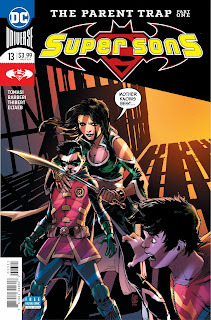 There is a nice tie-in to Silencer and also a resonable explanation for Talia slumming it a bit, but again, it all leads to the idea that everything in this issue is here to show Jon that Damian has a dark past...a very dark past! It all comes full circle when Damian finds out what his mom is really up to and who she is going to kill next. It's a pretty cool cliffhanger that will surely end in both the Super Sons mothers upset...or dead! Okay, I am getting tired of this jerkoff Damian, but by the end of the issue, I was having fun. Seeing the League of Assasins bow to Damian reminded me of Eddie Murphy in Coming to America (pleas go watch it if you haven't) and that put a big smile on my face. Plus, no matter how much Damian's portrayal upsets and confuses me, I still have Jon, the best little boy in all of comics. Please take note Tomasi...you don't have to make Damian a jerk to show how nice Jon is. Carlo Barberi's art is really good in this issue and while I always want Jorge Jimenez on this book, Carlo is a very, very good replacement. While I would like Peter Tomasi to give us more of his New 52 Damian magic in this book, I love Jon and this issue had some really good moments that made me smile. It's a real shame if the cancelation talk is true, because I am still waiting for this book to really get started and this issue seemed like I was finally going to get my wish.